Sit down and warm up with this decadent rose hot chocolate while you catch up on your favourite TV programme or YouTube channel. This warming drink is inspired by traditional hot chocolate recipes that start off by creating a thick, chocolatey paste. Afterwards, by adding a little bit of our magic ingredient rose water, this paste is transformed into a rich wintery drink ready to be devoured alone or in good company. Pro tip: perfect for dunking! Every single day is getting shorter (or if you’re based in Manchester like me the days are just constantly dark and gloomy!) and every little reason to treat yourself is acceptable. Having a bad day? Grab a hot chocolate. Nervous about an important event that’s just around the corner? Treat yourself to a hot chocolate. Or celebrating that great news you just got? Drink up your luxurious rose hot chocolate! I decided to create this warming rose hot chocolate to celebrate pungent rose flavours just strong enough to compete with rich cocoa. Did you know that all rose petals are edible? I’m absolutely and deeply head over heels in love with everything rose. It’s my favourite scent and having just recently discovered its use behind the kitchen counter, it has become one of my staples. P.S. – Quick tip for all the food photographers out there. Dried rose petals are some of the most photogenic photo props you can get your hands on! Most importantly, this recipe is for all of us chocolate loving vegans out there! Anyone else on a mission to prove to the world that going vegan has in no way stopped them from devouring chocolate? 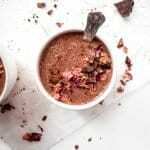 Well, this rose hot choc is a simple, and yet visually gorgeous way of showing everyone just that! Slowly add three tablespoons of almond milk to your cocoa powder and stir to create a thick, even paste. Add rose water, Ceylon cinnamon and stir well. Warm up the rest of your unsweetened milk ato desired temperature, and when warm, stir in your cocoa paste. Add your sweetener of choice (optional step, but I warmly recommend it to bring out the most of the flavours).